How not to set xafari as default property editor? the editor type "Xafari.Editors.Win.XafariGridListEditor" is in listviews for objects as a default listview editor. We are going to investigate this issue in near future. this would be quite useful if someone like me add xafari editors to a existing big project. after adding xafari editors module all the detailview and listviews would change to xafari editors and this would be frustrating for the developer and also for the client as the GUI would change and he might be confronted with error messages (if the view controller is not adapted). for a little project this would not be a problem but for a big solution the decision would be not using xafari editors at all if it takes too much effort to change all the editor types. The Xafari property editors are set as property editor types by default, if you add in your project Xafari Business modules (Business components), Xafari Enterprise modules (if the modules interact with business components ) or XafariEditorsModule (win/web). This behavior is typical of the Xafari Framework. 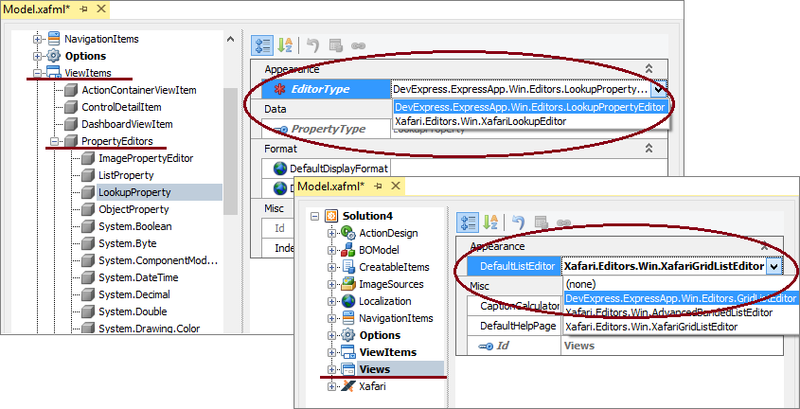 If you use this Xafari modules, you can not change this behavior and set Devexpress property editor types by default. After the manipulation all you LookupProperty will use the editor specified for EditorType and etc.